Joshua Logan Myers, 19, robbed a medical pot delivery service in the parking lot of the San Luis Obispo Costco on Dec. 11, 2017. San Luis Obispo police later arrested Myers, and he was booked into the SLO County Jail. 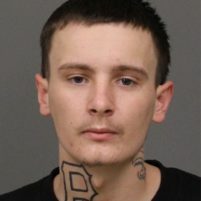 On Thursday, a San Luis Obispo jury convicted Myers of second-degree felony robbery and enhancements for using a firearm and for committing the crime for the benefit of a criminal street gang. The jury also convicted Myers of making criminal threats. Myers is the younger brother of Dystiny Myers, the runaway Santa Maria teen who was the victim of a brutal 2010 murder in SLO County. Joshua Myers’ sentencing is scheduled for Jan. 17, 2019 in the courtroom of Judge Matthew Guerrero. It is unclear how stiff of a sentence he is facing. Really sad, I know his family, in fact, at a young age, when I used to live here, Josh was the only friend I ever had. Breaks my heart to see that he did that because that isn’t like him. I probably wouldn’t be around today if he wasn’t there for me when we were kids. I hope the judge goes easy on him, he lost his sister, I was in fact at her place at the cemetery yesterday. I hope people will understand what a rough life he had already had, and will show him mercy, I just moved back to Santa Maria and haven’t seen him in 11 years, and just recently heard about this. California’s tough gun laws don’t mean much to criminals. The new norm brought to you by the voters of California. The yes vote for Proposition Head Up Your 64 sadly represents California’s best answer for solving our economic, crime, and drug crisis. What does this have to do with Prop64? Delivery services have been going on since 1996 for medical patients and I am pretty sure SLO didn’t have any legal recreational (prop64) delivery services in 2017. I don’t think they have any today, but I could be wrong.